Many times when we think about branding we think about firm culture, products and services and mission statements. Have you ever thought about your personal brand? No matter where your career path takes you, the one thing you’ll always carry with you is your personal brand. Your personal brand sets you apart from your fellow practitioners. Personal Branding in One Hour for Lawyers is a great read that explains how attorneys can highlight their unique talents and abilities, manage their perceptions and achieve greater success as a lawyer in the process. 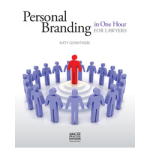 Author Katy Goshtasbi helps lawyers discover their personal brand and learn how to use it as a powerful marketing tool. Check out this and other helpful resources in our lending library today!